Parents assure children that he’s always been there and always will be. He’s rumored to have the ability to be in all places at once, knowing who has been naughty and who has been nice. He knows when you’ve been sleeping, and he knows when you’re awake. And one night of the year, he miraculously fits his gargantuan girth down countless chimneys to bestow gifts on all good children, then whisks back up again, having consumed cumulative mountains of goodies and rivers of milk left as offerings for his pleasure. Today we may know him as Santa Claus, but the omnipresent, omniscient, jovial fellow’s image evolved gradually through the years, adapting itself to different cultures around the world. Old rituals and beliefs interwove with new, resulting in a colorful tapestry of traditions with many common threads. Eventually, through increased travel and access to the written word, plus predominantly American influences from television, movies and other media, the modern, more singular image emerged. That the Santa Claus custom is largely based in recent American tradition may seem unlikely, in that early-17th-century Puritan immigrants actually outlawed Christmas and other rowdy nonbiblical holiday customs in parts of the New World. Yet subversive celebrations spread, and the Puritans’ law was repealed before the end of that century. Second- and third-generation immigrants began forming a new middle class with the luxury of disposable income and family-centered leisure time. Wider availability of affordable printed matter contributed to social cohesion, and people devoured it heartily. Whatever was in print became the common reality, and this eventually succeeded in forging the disparate traditions of an immigrant population into a more homogeneous set of customs, including one heroic Christmas figure for all. But Santa’s pedigree goes back much farther than America’s European immigrants. In fact, by working backward through history, we find that he has been with us in various guises for thousands of years. 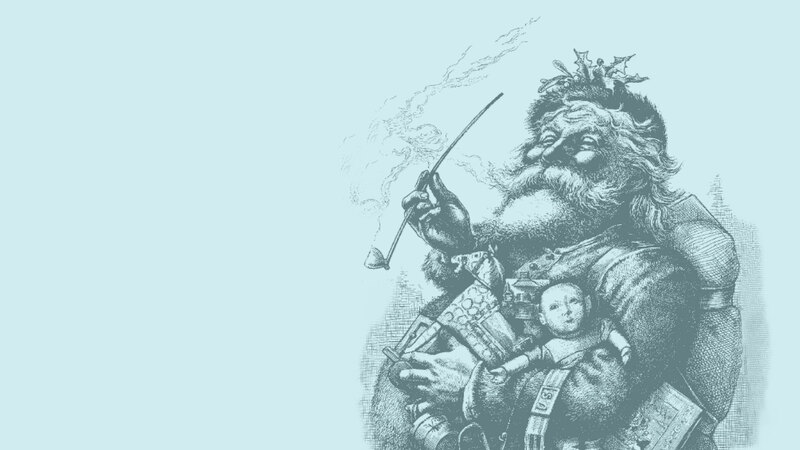 Nineteenth-century American author Washington Irving was the first of several writers to have a major influence on the development of Santa’s modern persona. Irving and his social circle were concerned that the Christmas season was, for many, a time of excessive drinking and overturning rules; entering homes of the wealthy and demanding favors and refreshments (“Oh bring us some figgy pudding and a cup of good cheer”); and threatening noncompliant hosts with vandalism. With lofty hopes of transforming the saturnalian rampages plaguing the season, Irving wrote of the joys of a different type of celebration in his satiric Knickerbocker’s History of New York from the Beginning of the World to the End of the Dutch Dynasty. After 1822 a pint-sized “right jolly old elf”—flying from chimney to chimney on “the night before Christmas” in a miniature sleigh pulled by eight tiny, named reindeer, a bag of toys slung over his shoulder—became the new standard, thanks to the just-published “Account of a Visit From St. Nicholas.” The immediate and lasting popularity of this poem (attributed to Clement Clarke Moore) undoubtedly owes a debt to the inclusion of elements from numerous cultures. The author combined Irving’s innovative descriptions with longstanding Scandinavian, Germanic, English and Russian traditions. Even the Scottish and the Irish could relate to the little elfin creature, similar to the brownies, “little people” or leprechauns of their homelands. Across the Atlantic, Charles Dickens contributed to the reformation of Christmas with A Christmas Carol, published in England in 1843. Although Dickens did not mention Santa Claus by name in the book, the spirit is clearly familiar. Embracing Victorian England’s ideals of hearth and home, the book was an instant bestseller. It went a long way toward forming the present Christmas ideal of a family-friendly tradition and turning riotous drunken revelry into a mere ghost of Christmas past. Soon Harper’s Weekly, a popular American publication of the time, began an annual tradition featuring illustrator Thomas Nast’s drawings of Santa in a red fur-trimmed suit, black boots and matching leather belt. Although elements from Dickens’s tale were evident, Nast, an immigrant from Germanic Europe, also used elements gleaned from his own cultural background. This conflation of Continental and American customs continued over the next quarter century, contributing such details as where Santa lives and works. By the turn of the 20th century, America had accepted Christmas widely enough to make it an official holiday, and colored, illustrated Christmas cards (already popular in Victorian England) became commercially successful. Both factors helped buttress the image of the burly benefactor in red knickers (although other colors still appeared on occasion). By the time the next generation was ready for annual supernatural nocturnal visits, a man-sized, rosy-cheeked, rotund Santa Claus dressed in red with snowy locks and beard had become the norm. This American image of Santa, particularly the iconic illustrations created after 1931 by commercial artist Haddon Sundblom for Coca-Cola advertisements, has now been exported worldwide. But what of Santa’s antecedents? Today some of the older iterations remain alongside the new and improved commercial versions. This makes for a peculiar cacophony of interconnected characters. In parts of Europe, a Christ-child representation (Christkindl/Kris Kringle) united with an older tradition: a horned, fur-clad, swarthy Belsnickle/Pelznickel (pelts, or fur, plus Nicholas). This scary figure made late-night, year-end jaunts before the onslaught of Christianity forced a change. Similar devilish characters in various parts of the world, including Knecht Ruprecht, Rumpelklas, Krampus, Schmutzli, Hans Muff, Klaubauf, Père Fouettard and even Beelzebub, may also travel alone or accompany Father Christmas, Père Noël, Papa Noël, and of course, jolly old Saint Nick. And common to each tradition is a connection with Saint Nicholas. The fourth-century Nicholas of Myra is one of the most revered saints of the Catholic Church. Though evidence is sketchy at best, he is commonly believed to have been appointed bishop of Myra, in Asia Minor, at a tender age. This conviction forms the basis of boy-bishop traditions, in which authority turns upside down and servants and children demand gifts or favors from their masters or parents (for example, yesterday’s “figgy pudding” requests and today’s “I want a pony, an Xbox 720 and a skate park for Christmas”). Such traditions spring from similar Roman Saturnalia rituals relating to the winter solstice season. Details of Nicholas’s later life and beyond are likewise legendary. He became known as Nicholas of Bari after Italian merchants took what were purported to be his remains to the city of Bari in the 11th century. Some say his tomb, housed in an impressive basilica, is near the site of an ancient shrine to La Befana, the legendary grandmotherly crone or witch on a broom who was responsible for sweeping down chimneys and filling children’s stockings with gifts one night each winter. Although La Befana lore lingered on in Italy, during the following centuries Nicholas’s shrine became the overwhelmingly popular destination of pilgrims. His larger-than-life story includes much fodder for folklore, which even the Catholic Church acknowledges is not necessarily based in fact. Saint Nicholas’s feast day was even dropped from mandatory observance on the Roman Catholic liturgical calendar in 1969 for lack of proof of his existence, though the Eastern Orthodox Church still observes December 6 as his feast day. According to the Catholic Information Network, Nicholas replaced the Russian “Mikoula, the god of harvest, ‘who will replace God, when God becomes too old.’” Mikoula was said to distribute gifts to children during the winter solstice, a job that Nicholas, Russia’s new patron saint, soon took over in popular imagination. Nicholas is even said to have miraculously restored to life the chopped bodies of three boys put into a tub of salty brine by a malevolent butcher. This story seems to be a gory distortion of another legend, where Nicholas simply saved three boys from drowning in the salty sea. As insurance, concerned sailors were known to throw three loaves of bread into the churning sea as an offering to the saint, who could calm and even walk on the water. In some areas he is still offered bread or other wheat products (cookies too!). The wheat offering is related to a tale in which he miraculously saved Myra from famine by multiplying borrowed wheat from passing ships, with enough left over after feeding the multitudes to plant crops for the coming season. Such tales are reminiscent of an earlier deity: Poseidon, god of sea and streams and father of the winged horse Pegasus, or Poseidon’s Roman counterpart, Neptune. As the Catholic Church gained power, they appropriated many of the popular pagan deities for Christian use. Pagan temples and idols were revamped into churches and shrines for the worship of newly christened saints. The church simply transferred the qualities and powers of the old gods and goddesses to the new saints, and worship and prayer continued as before. In the East, they took Poseidon’s trident and gave it to Nicholas in the form of a crosier—a pastoral staff, commonly said to represent the crook of the Good Shepherd and found today in the form of striped peppermint at Christmastime. As “Christianization” marched on, more pagan rites and personages were assimilated into diverse adaptations of Nicholas. His name and some of his characteristics tie in with ancient Norse mythology as well: the supreme god Odin assumes variations of the names of Nickar, Hnikar or Nick when appearing as a destructive water sprite capable of walking on the water and calming or raising tempestuous storms. (“Old Nick,” another appellation of the devil, stems from this term.) Odin also appears as a bearded deity with a trident or a spear on a midwinter flight, piloting a windborne Pegasus-like horse and frequently accompanied by diminutive aides of varying deportment who distribute gifts to the deserving and discipline the wicked. The fact that Odin is pictured as both good and evil seems paradoxical, but it was not unusual for polytheistic societies to have gods with both good and bad attributes. This explains how St. Nick and Old Nick can derive from the same character. Other ancient Norse and Teutonic traditions familiar today include food and drink offerings set out to placate the divine ones, and sacred trees that reach to the heavens, pointing to a pole star and the home of the gods. Saint Nicholas and his festivals readily absorbed such elements, and the celebrations continued through the centuries. With the Protestant Reformation of the 16th century, Catholic saint worship was reviled as anathema, the reformers being quick to point out that it replicated polytheistic pagan rituals. But Nicholas-related traditions were not easily uprooted. It was now the newly adopted symbolic Christ child who determined which children got gifts and which were punished, but to accommodate public preference, the saint was sometimes retained in a lesser role, appearing as the dark, occasionally horned elfin helper reminiscent of the Greek Pan or Roman Faunus (whose festival was on December 5). In the Netherlands, however, Sinterklaas survived the overhaul nearly unscathed. Each year he arrives by boat with his white horse, accompanied by a helper of his own (Zwarte Piet/Black Peter). The latter distributes delicacies to good children and may threaten to carry naughty children back to Spain in his empty sack, while the mitered saint delivers gifts to people’s homes each December 5, the eve of his feast day. Sinterklaas notwithstanding, the Reformation managed to suspend many Christmas celebrations and Nicholas-related observances, and the Thirty Years’ War that devastated Europe from 1618 to 1648 further disrupted ancient traditions and customs. Still, with time, travel and tolerance, Santa Claus and his serpentine line of incarnations seem, for now, to be having the last ho-ho-ho. Washington Irving, Knickerbocker’s History of New York (1809). George H. McKnight, St. Nicholas: His Legend and His Role in the Christmas Celebration and Other Popular Customs (1917). Clement A. Miles, Christmas Customs and Traditions: Their History and Significance (1912, 1976). Insight Video: Truth or Tradition?